****Please NOTE**** The 4th of July falls on a Tuesday this year! 4th of JULY IS NEXT WEEK!?!?!? We have a couple of vegetable goals we like to meet for the Fourth of July: first zucchini, first red tomato, golf ball sized potatoes, first cucumber. All the vegetables (well they are technically fruit) that flower and then set fruit; cucumbers, winter squash, summer squash, tomatoes, eggplant, and peppers, produce slowly at first and then ramp up production until they peak and then they slow down again. We LOVE including summer goodies in our CSA shares and you better believe as soon as we have 100 peppers, zucchini, cucumbers, or tomatoes in a week we will be putting them in your box; we can’t really split 20 zucchinis between 100 families..but have no fear...zucchini is coming to your box soon! 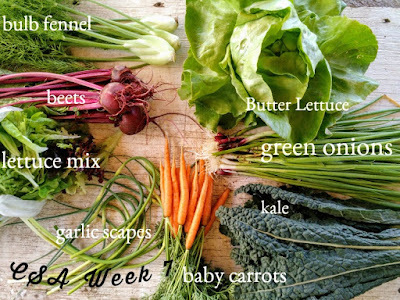 I don’t usually include broccoli and cauliflower in the “by Fourth of July’ list because I assume it’s a given that, with our earliest planting date, we should have it in late June...but ALAS! All the heading kohl crops (brocolli, cabbage, cauliflower, and romanesco) took such a beating from the wind this spring that they are further behind than usual. With the heat and sun now, it’s easy to forget what a dark (like no sun!NONE!no sun at all! ), cold, rainy, March and April we had. We also had, pretty much, a weekly Crazy Wind Event. Despite all the weather, the early planting of heading kohl crops went through they are starting to head up and look awesome. 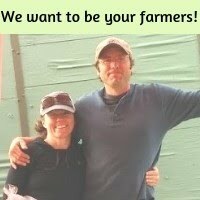 We are thinking cabbage and broccoli in the next two weeks with cauliflower and romanesco by mid July. We have succession plantings after that to hopefully keep them coming through August and September. Pre-chopping things for the week saves a ton of time! Chop stuff up and keep it ready to quickly use. I’ve been chopping up a couple bundles of those incredible green onions every few days and keeping them in a lidded Pyrex container for easily topping EVERYTHING. Weekly egg bake – I’ve had a few people ask for a recipe or guide for the ‘egg bake’ I often mention. Each week we wisk 2-3 dozen eggs, ~1/2 cup cream, salt and pepper and add to a large casserole dish. Then I take about 1.5-3 pounds of whatever leafy greens I have around (kale, chard, super greens, baby kale, beet tops, etc., ) I saute butter, chopped green onions, and while that cooks I add the greens; it seems like a ton of greens but it cooks down, sometimes I add some balsamic vinegar. I take the sauteed greens and put them in the casserole, they kind of fall down into the raw eggs, then top with chopped fresh herbs (lately dill later in summer i’ll switch to basil, and then parsley in fall) top the whole thing with a generous amount of cheese and bake until it’s not runny. Butter Lettuce- this is the last time for butter lettuce in the shares until fall. It prefers cool weather. We have an experimental planting started now to see if we can keep it coming through the heat but usually summer lettuce is red leaf or red romaine as they do better in the heat. 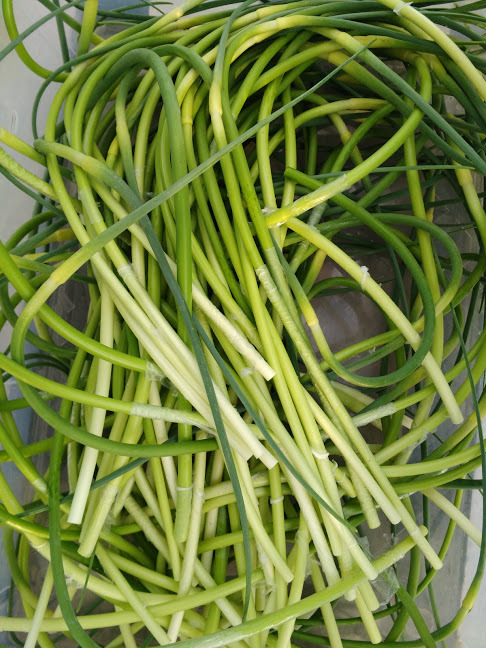 Garlic Scapes- The scape is the garlic plant making a seed head; if left on the plant the plant would put more energy into making seed and less into the bulb. When garlic is scaping we harvest it everyday to get the scapes while they are young and tender; hopefully before they have made a full ‘circle’. If left on the plant longer they make a big curly cue like a corkscrew. You can chop your garlic scape and use it as you would use garlic in any recipe. If kept in a sealed plastic bag your scapes should keep in the fridge for 2-4 weeks...but we bet they will disappear into casseroles, stir frys, and dressings long before that. 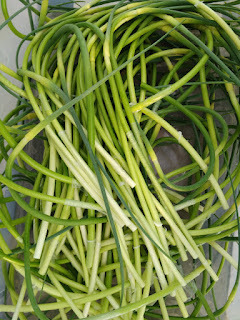 We have been hoarding the scapes the last week in order to have a nice pile of them for you in this week’s share. THIS WILL BE THE ONLY WEEK WE HAVE SCAPES IN THE SHARES. Other scape ideas; use a veggie peeler to make long peels and top with pizza. Coil into a spiral and put on a skewer for the most beautiful kabob EVER. Give it a quick blend in the blender or food processor with olive oil and freeze it to use later. Dill would be great with a cold beet salad, and I thought you might want to make one too :). Roast or boil beets until tender, slice or cube and add olive oil and salt. Chop and top with dill. You could make the dill creamy by adding yogurt, heavy cream or the cream from the top of canned coconut milk. Every bit of fennel is edible; the frothy tops are a lovely culinary fresh herb. The stems can be frozen and added to vegetable stock/soup. And the bulb is delicious cored and thinly sliced and used raw in salad or slaw or lightly sauteed.